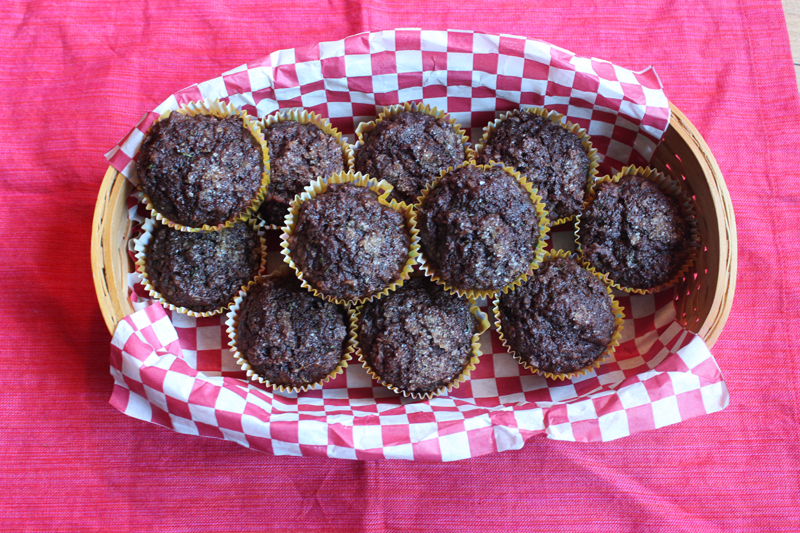 I confess that I was very, very nervous while I was making these zucchini chocolate coconut muffins. I changed so many elements of this recipe that I had no idea if I was going to be elated by success or depressed by failure, and then have to go hungry as well. But sometimes a baker has to take a few chances. 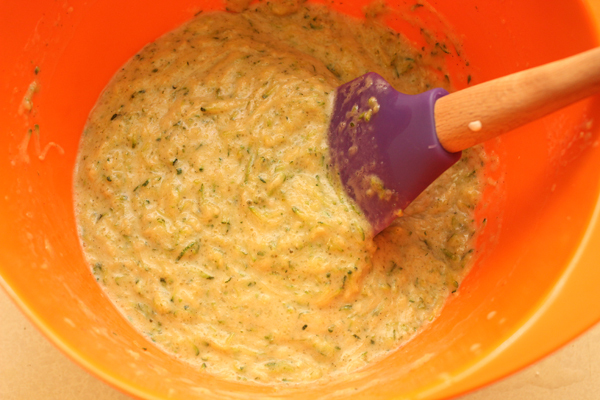 I started by grating the zucchini very finely, and drained it a few times, squeezing the (disgusting green) moisture out with paper towels. 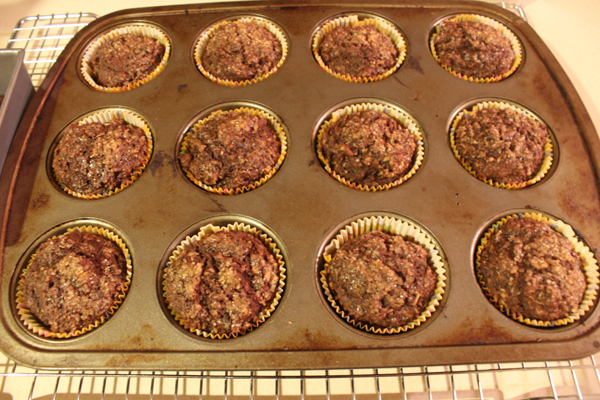 My goal was to keep the muffins from being about zucchini instead of ingredients that actually look and taste good. 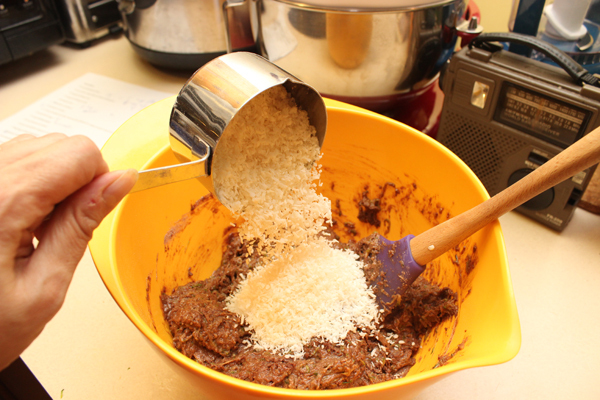 Then I started playing around with the dry ingredients. I decided to skip the chocolate chips, and use cocoa instead, which necessitated some creative measuring and ratio juggling of flour, wheat germ, and cocoa powder. 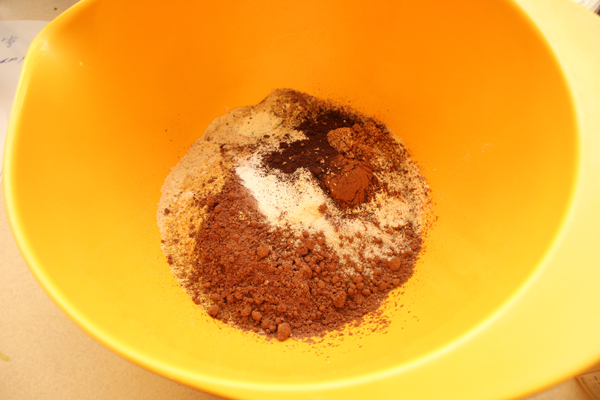 I kept the baking soda, baking powder, and salt in as specified — there’s chemistry involved, after all — but I doubled both the cinnamon and nutmeg and then threw in a half teaspoon of espresso powder to give the cocoa powder a little boost. 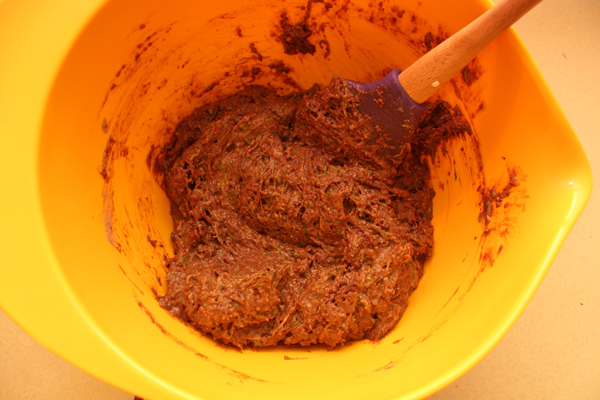 I whisked, pressing into any cocoa powder lumps I could find. 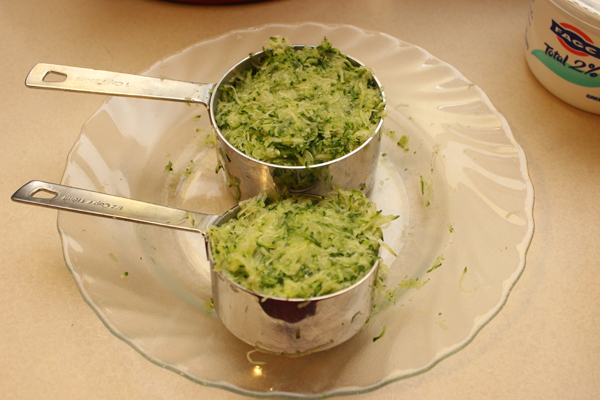 Then it was time to plop the zucchini into a bowl. I added sugars, cutting them down to half a cup, split between brown and turbinado, and added coconut oil, low fat Greek yogurt, an egg, and some vanilla bean paste. I couldn’t decide which looked less appealing, the unmixed version or the mixed one. They both scared me, just a little. This sequence didn’t make me feel much better. I was reassured after some good spatula work. And things took a turn for the better when I added the coconut, a full cup. 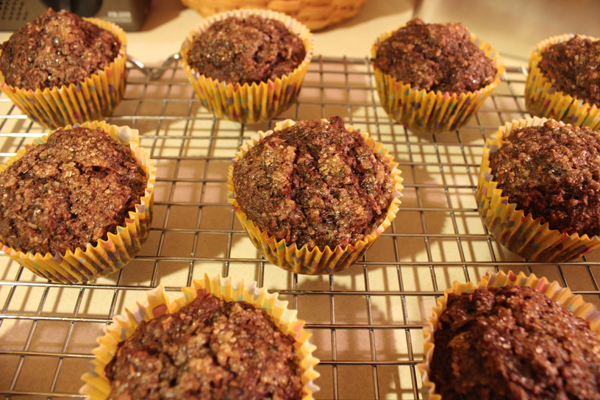 I folded it in, and scooped the batter into muffin cups. The batter was so thick and gooey that it had to be pried off the ice cream scoop. Dave was slightly unnerved by this, but I thought that was the least of my problems; the big issue was determining how long to bake these for and at what temperature. 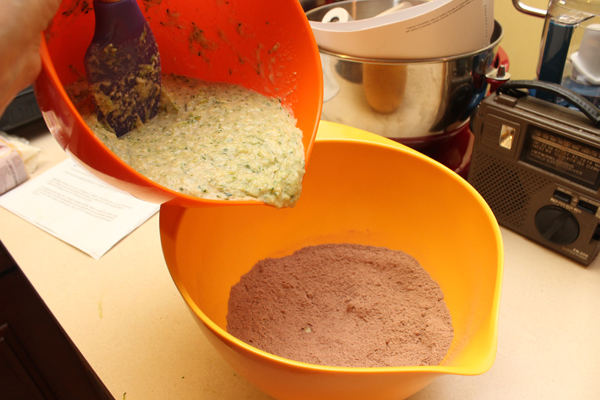 The original recipe said to use three 4-inch cake pans. Who has 4-inch cake pans? Not me! The other option suggested was a loaf pan, but I had my heart set on muffins. I’d already decided that 350 wasn’t a high enough temperature for these babies, and preheated the oven to 425. While it was heating up, I sprinkled a little turbinado sugar on top of the muffins. It didn’t help their looks much. I had a little extra batter, so I made a mini loaf too. I put both trays in the oven, reduced the temperature to 400, and crossed my fingers. After five more minutes, I reduced it to 375. I don’t know why. I just did it. I checked them ten minutes later. Not done. Sadly, they didn’t look much nicer. In fact, they looked just as blobby and lumpy as they did going in. I let them cool for a while, and finally went back into the kitchen for a taste. That’s when I discovered the coconut chocolate joy. I discovered it again the next day for breakfast, and then for dessert after dinner, and then for breakfast again. The rest were devoured by my co-workers, who could not have been more disappointed when the muffin well ran dry. I am definitely making these again, and somehow I will try to make them pretty. (I admit I also find it very challenging to photograph such dark colors, the right light balance always eludes me.) I almost don’t want to link to the original recipe because you’ll see what they’re supposed to look like, but my baking ethic dictates otherwise. Or is it my blogging ethic? I don’t know. Stupid conscience. Heat oven to 425 degrees — you will reduce the temperature later — and spray or line a 12-cup muffin tin and a mini loaf pan. 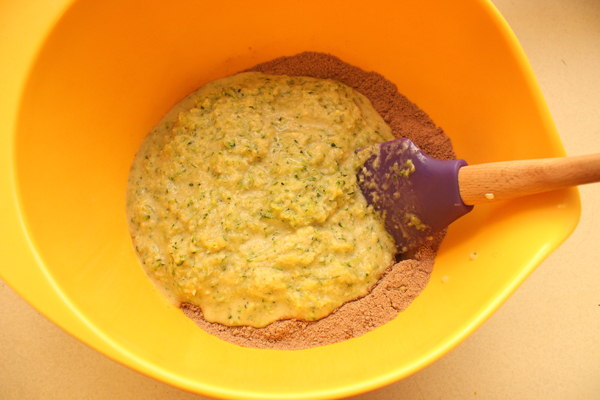 In a large bowl, whisk together the flour, wheat germ, cocoa powder, baking soda, baking powder, salt, cinnamon, nutmeg, and espresso powder. 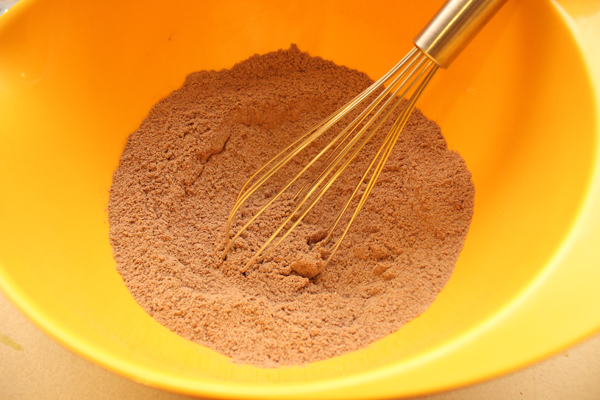 Be sure to eliminate any cocoa powder lumps. 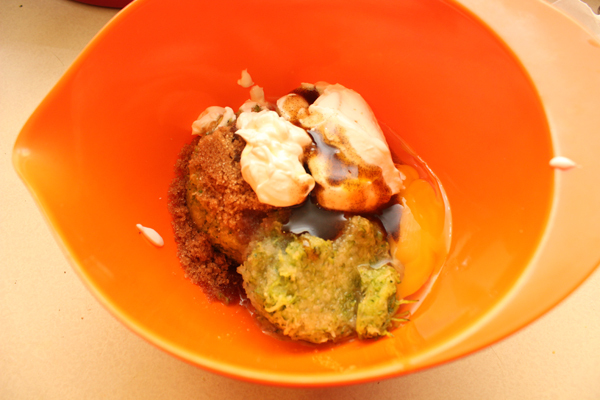 In another bowl, combine the zucchini, yogurt, sugars, coconut oil, egg, and vanilla. Mix well. 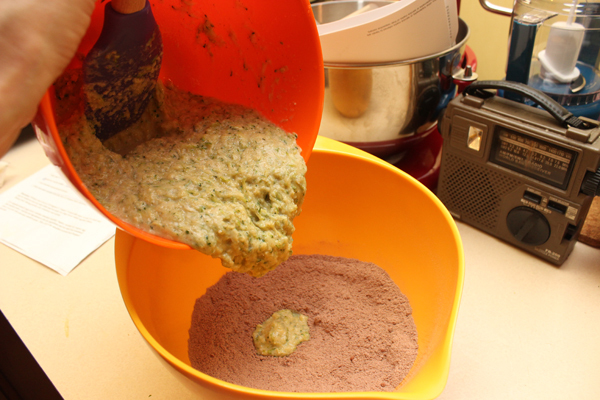 Pour the liquid ingredients into the flour mixture and stir just until fully incorporated. Fold in the coconut. 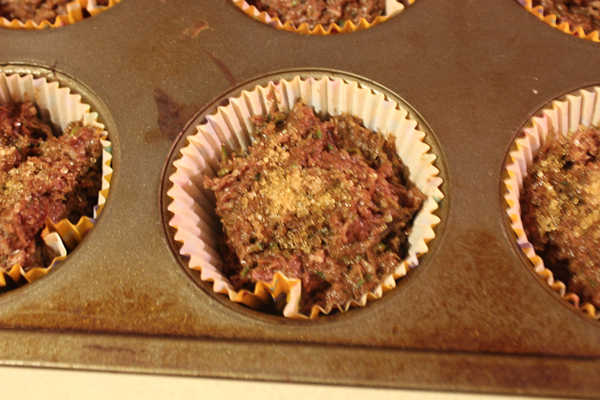 Scoop into muffin tins and mini loaf pan and sprinkle turbinado sugar on top of each. 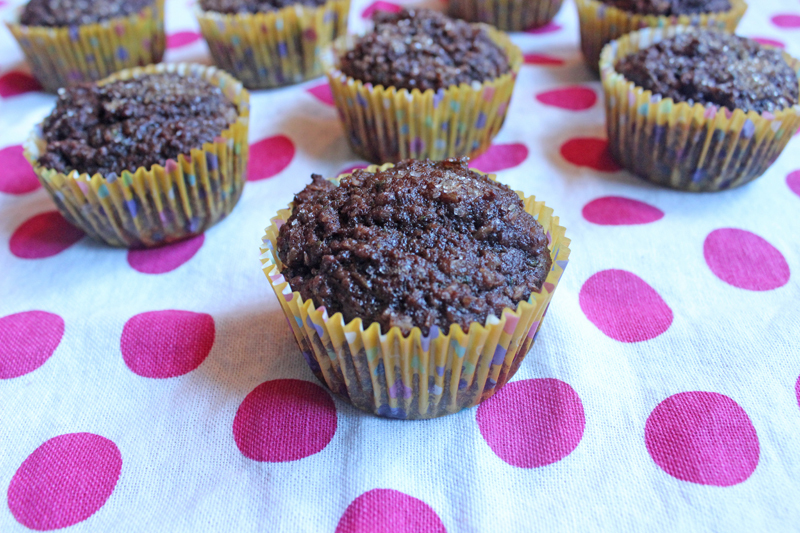 Put muffins in the oven and reduce temperature to 400 degrees. After another five minutes, reduce to 375. Bake for another 15-20 minutes, until a toothpick comes out clean. Let cool in the pan for a few more minutes, then remove to a wire rack to cool. I have no idea how to store these, they weren’t around long enough for me to find out.